« Netflix = A Widescreen Brand Disaster? Picking a costume is a fun and personal decision, and with no lack of choices, what does it say about our society when someone shimmies into a specific representation of a branded product? What’s behind this shift away from mummy and princesses towards McDonald’s fries and walking iPads? As entertainment markets have fragmented into dozens of sub-genres, film and TV references are naturally more obscure than they used to be. 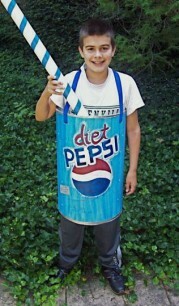 So, if a Halloween party-goer is looking for recognition, attending a party in a DIY Aquafresh tube outfit will probably be received better than a meticulously-created-yet-little-known Star Trek character costume. Over the past decade, consumer products have been branded in more distinctive and clever ways, and we’ve wholeheartedly accepted these items into our daily lives with gusto, building ever more robust emotional (and subconscious) attachments to such products as electronics, cleaning supplies, sports clothing, food and beverages, and countless others. Culturally speaking, it’s often been suggested that uncertain economic times draw the public away from film dramas, and towards escapist comedies and fantasies. With the global markets still tenuous, to an anxious public, horror costumes like witches and Wolf Men may seem less desirable than a walking Coca-Cola can. Marketers have succeeded in pushing Halloween as an adult holiday, and the results have been predictable. After all, it’s adults who buy all the candy and decorations, and it’s adults who purchase the costumes, and it’s adults who use most consumer products. The more grown-ups involved in Halloween, the more their fingerprints will appear on its various aspects. So that’s the landscape, but how does a brand get in on this action? Producing a licensed costume seems like an obvious choice. 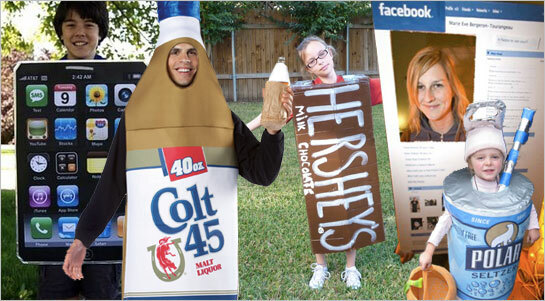 Though branded Halloween digs are becoming increasingly common, an organization rushing to market with a branded getup may be missing the point. It’s not the availability of a costume that’s going to entice people to wear it — it’s their feelings towards the brand in the first place. The stronger and more personal connection we foster towards individual products, the more likely we are to see those products as extensions of ourselves. And with a strong enough bond, we’ll create the costume ourselves, as the thousands of homemade iPod costumes from a few years ago demonstrate. Whatever opinions you hold about Apple as an organization, the design of their products is second-to-none. Consumers often pay a premium for the design, but the resulting bond that ensues is a powerful force that even today many other manufacturers have failed to realize. It’s not just the devices, though — Apple customer service routinely ranks high in surveys, which further imprints the company’s value and and friendliness amongst their customers. Facebook page costumes have flourished over the past few years, in a way that we never quite saw with MySpace, even at the height of its popularity. Facebook’s consistent color scheme and standard visual look allow it to be recognizable from a distance, with the quickest of glances (A blue and white page with a sidebar, and bam — you’re a Facebook page). A MySpace costume, on the other hand, would not be nearly as identifiable, as they all looked so different. 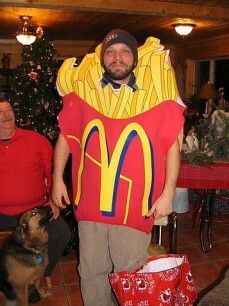 You want your costume to be recognizable. Twenty years ago, bottled water barely existed. Today, it’s a multi-billion dollar industry and people are dressing their kids up in as Fuji water bottles for Halloween. This is a direct result of two decades of singular messaging: Bottled water is the freshest, cleanest, safest water you can buy. Despite this being demonstrably false, the powerful and consistent message has cemented itself in the public psyche, and the results speak for themselves. Halloween only comes around once a year (as of this writing, anyway), and there’s no lack of costume choices. Those consumer brands that have made the leap from shelf to costume have accomplished something incredible. But it’s not so much the result of fickle consumer choices, as it is the byproduct of strong and consistent brand platforms, visuals, and messaging. With those in place, there’s no telling what people will be wearing come Halloween. Great post! “It’s not the availability of a costume that’s going to entice people to wear it — it’s their feelings towards the brand in the first place.” – I completely agree. I think you make some excellent and very true points, both about the connection people feel to certain brands and how those brands become extensions of themselves. Like you said, many of those brands are almost universally recognized and that does foster a sense of comfort and shared experience. Thank you for blogging this, really informative blog article, it’s precisely what I was wanting. You have a great blog, I am glad I found it.